Eyewitnesses play a very important role in news coverage. Yet, scholarly research on eyewitness misidentification and memory distortion is virtually absent in scholarly work in journalism and related academic fields. 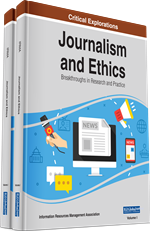 This chapter emphasizes the need for such a research agenda by analyzing the amount of mistakes student journalists made in a news report they wrote during a 20-minute classroom exercise. Each of the stories about a staged bar fight, except for one, contained pieces of misinformation because the students often blindly trusted eyewitnesses and messages on social media accounts. The results indicated that there is a need for more advanced information and media literacy modules in journalism curricula to avoid inaccurate information from eyewitnesses to be disseminated to the public. Journalists are vulnerable to the possibility of making mistakes in an effort to deliver news in a short amount of time, if not instantly through live coverage, with the 24/7 demand for news. As a result, many stories include one or more errors (Maier, 2005) and it is neither a surprise that, subsequently, trust in news has been declining for decades. A recent study indicated that only about one-fifth of U.S. adults trusts local and national news outlets to a high degree (Mitchell, Gottfried, Barthel, & Shearer, 2016). According to Porlezza and Russ-Mohl (2013), “No tenet of journalism is as widely accepted as the obligation to report the facts accurately. But from the public’s point of view, journalists show short of their high-held principles” (p. 45). This downturn in support of the press has been evident for years, but news outlets and other types of media are still utilized by the masses to make sense of the world around them. Consequently, it is important for members of the public to understand how “media messages are constructed and the skills needed to interpret them” (Maksl, Craft, Ashley, & Miller, 2016, p. 229). This kind of knowledge would make them better equipped to decipher truthful reports from misinformation (Tully & Vraga, 2017; Whitworth, 2009). Journalists, thus, play an important double role in this process: First and foremost, they are news consumers themselves as any other regular person within a community, but they have a special position by also contributing and shaping the media ecosystem. Not only do they need media literacy skills to process the information they receive throughout each day, they also must use those skills to better interpret information that they gather for their news reports. Ideally, that would lead to lower amounts of misinformation disseminated by news media and better-informed citizens as well (Wright, Shemberger, & Price, 2016). Therefore, it is very important that new generations of journalists are trained to the fullest extent to untangle truth from lies when they attempt to relay information from their sources to the audiences they serve (Claussen, 2006), especially since some recent research boldly concluded that “most young folks are completely unprepared to be responsible news consumers in the Internet age” (Dyer, 2016). The opposite of this statement must be true for a society to thrive, and educational efforts are indispensable to help people to become better evaluators of media messages. As Van der Linde (2010) pointed out, media literacy education could “empower both media professionals and consumers thereby allowing them to analyse critically, monitor and moderate media messages in order to reduce any negative impacts of the media and ensure enhanced enjoyment and discourse” (p. 1). That means, among many other things, that journalists and other people alike need an advanced understanding of how their own cognitive biases and perceptions play a role in assessing information. Those processes encompass instants in which people make decisions about what information gets included or excluded when they communicate with others—either in their private life or as professional gatekeepers of (news) information to larger audiences. Without such an understanding, people erroneously may think they are invulnerable to being misled by misinformation. Instead, it is very important for individuals to realize that further development of media literacy skills is beneficial to themselves and others. For instance, it is important for reporters and editors to detect mistakes or falsehoods by human sources, including eyewitnesses on which journalists rely on almost daily.